Downtown San Diego promises to be one of the most beautiful and prominent waterfront urban areas in the country. Much development took place since early 2000 and many more development projects are scheduled to be completed by 2022. Below we offer relevant information, renderings and videos of the most interesting public and private redevelopment projects taking place in downtown San Diego. Below is a quick snapshot of each downtown San Diego redevelopment project currently on the works, already completed or to be completed in the near future. Please click on any project for relevant information, photos, videos, etc. Please do not hesitate to contact us if we can be of any assistance or provide additional information. The North Embarcadero Visionary Plan is a multi-phased redevelopment of the downtown San Diego Waterfront. It proposes to move harbor drive 40 feet East and build and esplanade. It also includes public arts displays, tree groves and open spaces. Manchester Pacific Gateway, also referred to as the Navy Broadway Complex project is a $1.5 billion, 3.25-million-square-foot plan that would include hotels, offices, retail and public spaces as well as a new Navy headquarters office building. This $1 billion project called “The Green Build” is the largest improvement project in the airport’s history. Project highlights include: 10 new gates, dual level roadway, curbside check in, new dine & shop establishments, enhanced security. The County Administration Building Waterfront Park is a new waterfront park covering 8 acres of prime space in the Columbia (Waterfront) District. The parking lots surrounding the historic County Administration Building were transformed into 8 acres of green space with children’s play areas, water features and underground parking. Project cost was $49.4 million. Estimated to be completed by the summer of 2015 (plans got delayed several times), the 1.5 acre Horton Plaza park will cost an estimated $8 million. As part of the agreement between the city and Westfield is that Westfield must put over 200 events per year which might include Farmers markets, concerts, movie series and holiday celebrations. The Ruocco Park is located on 3.3 acres along the San Diego Waterfront, next to Seaport Village, west of Pacific Highway and South of Harbor Drive. Ruocco Park is an open green space that integrates the use of hardscape, ornamental horticulture and art. Located next to San Diego’s Seaport Village, the San Diego Old Police Headquarters (OPH), a San Diego designated historic building was built 1930′s and served remained active and used by the San Diego police until 1987. Vacant for over 25 years the project is expected to restore, rehab and reuse the building, courtyards and surrounding areas for retail, restaurant and entertainment use as well as public market use. It will also add about 1 acres of public park plaza area adjacent to the buildings. Makers Quarters will be an urban mixed-use neighborhood with the East Village District of downtown San Diego located between 14th and 17th streets between Broadway and G Streets. Project will include a 400 foot tall residential tower, two mid rise buildings with green roofs, mixing offices and residences, three low rise, loft style office buildings catering to the flexible, open floor plan desired by high tech design firms, one hotel and a plaza. The bridge was designed to be one of the longest self-anchored pedestrian suspension bridges in the world (550 feet) and it will surely become a San Diego Icon. It design is to resemble that of a sail to fit with San Diego’s nautical history and its main purpose is to link two of San Diego’s biggest assets: The San Diego Bay and Balboa Park. Since the 60′s Lane Field has been used as a parking lot structure for cruise boat passengers and the general public. Before that it served as a baseball stadium from 1936 to 1957. 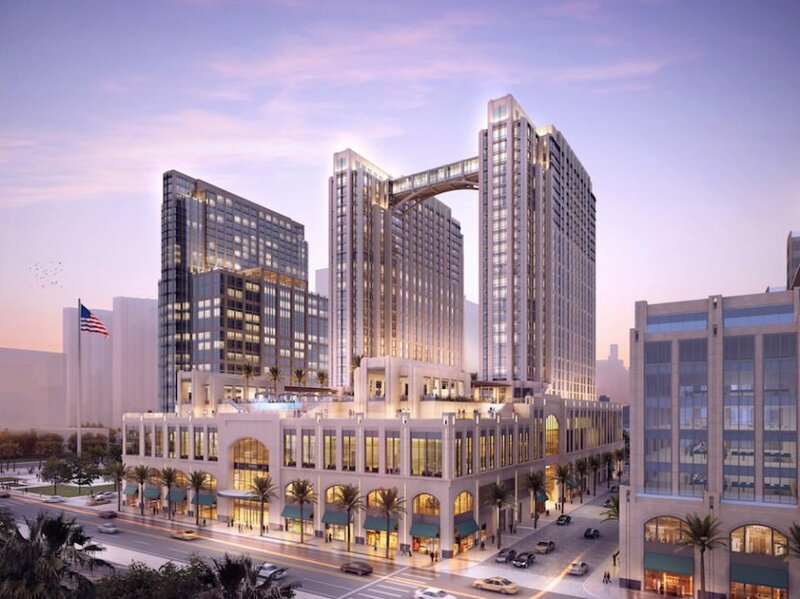 The Lane Field project includes two hotel towers totaling 800 rooms, a 2 acre public park, 60,000 square feet of retail and restaurant space and approximately 1,000 parking space. 350 Seat, 5,000 Sq Ft Pavillion with a main stage allowing events of all sizes. Central gathering area with shade and benches and reading room. Coastal chaparral: a garden area complete with vegetation and landscape representative of California. The San Diego Quiet Zone project was a $20.6 million endeavor to improve safety features of railroad crossings and also to help residents that were being burdened by constant train noise. The quiet zone covers the 13 crossings between Laurel Street and Park Blvd and train conductors are now required to stop the honking at railroad crossings because all crossing have been revamped to take on necessary precautions and safety features. Please contact us with any questions or if we can assist you on your search for any specific downtown San Diego redevelopment project.